Kidderminster Harriers head coach Dave Hockaday says his struggling side "must not get any lower" than Saturday's FA Cup qualifying defeat by Stourbridge. Harriers, bottom of the National League without a win all season, were beaten 3-0 by the seventh-tier Glassboys to miss out on the first round proper. "We've all got to look at ourselves," Hockaday, 57, said. "We cannot get any lower than that - over my dead body. This club is too big to suffer that without a reaction." 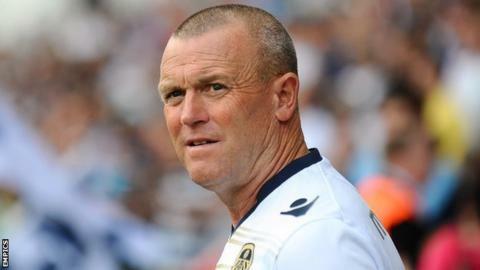 Former Leeds boss Hockaday took over at Aggborough on 9 October and has seen his side lose two and draw one of the three league games since he arrived. But their FA Cup fourth qualifying round shock was a new low. Dave Hockaday started his reign with a 2-1 defeat by Macclesfield. Their long-awaited first win of the season looked to be coming at Altrincham three days later, only for a 94th-minute equaliser to deny them. Hockaday's first home game against Southport ended in another defeat as they conceded the only goal of the game three minutes from time. With a potential money-spinning run in the FA Cup beckoning, Harriers were bundled out 3-0 by Stourbridge, two divisions below them in the non-league pyramid. "That has to be the watershed moment," Hockaday added. "We cannot have three players performing and the rest showing no bravery or match-management. "It's a tough place for the fans at the moment and for me. It looks good in training but, on a match day, it's a different kettle of fish - we cannot cope with the situation we're in." Hockday's options on the field have been limited by the club's difficult financial situation, which saw them start the current campaign with a playing budget slashed by 50%. Although six players have been signed since he became head coach, Hockaday says working with young players under such tight restrictions brings challenges. "The lads are struggling to take on information - I know they're young and we haven't won - but we will do," he said. "It would help if I had quality on the bench so I could rest the younger players, but we haven't. The club are in transition, they're in chaos. "Those that I don't deem brave enough or good enough will move on. At the end of the season, we will have players that will give everything - but we're nowhere near that at the moment."